Our beef netting is perfect for beef, horse or loin! Available in a variety of weights, materials or packaging, it's versitile enough for every need. We can sew to your specifications or ship it as bulk or rolled tubing. Additionally, some of our customers have found a more unconventional use for it, Halloween Decorations! Check out our Halloween page for more information and some photos from some our the haunts using Trenton Mills' beef netting! Each pound of Polyester Netting yields 16 yards of material. The beef netting comes in tube form. To make spider webs the tube is cut to desired length on one side of the tube to make into a flat panel. Then panel should be stretched and edges tacked very taut where spider web effect is desired. Using a sharp object such as an exacto knife or sharp box cutter, poke or slash the stretched panel several times to give the desired spider web desired. It is very important to have it stretched as tight as possible to give best results. If placing in a location where it cannot be tacked tight before cutting holes, holes can be cut prior to tacking up. 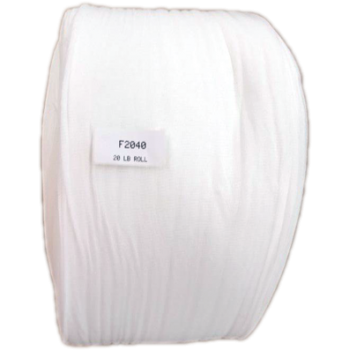 This product is a very stretchy, natural off white color but can be dyed. Fire retardant can be applied to Style 1840-46, as it is a 50% cotton/50% polyester blend. The tube is approximately 12 inches wide before cutting into flat panel (approximately 24 inches when cut flat). NOTE: This product is not for children, as handling of a sharp object is required.